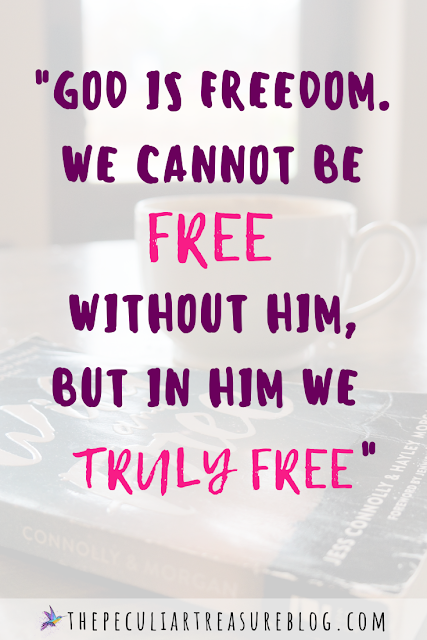 God calls us to live free in Christ. He calls us to be wild and free in our identities in Him. 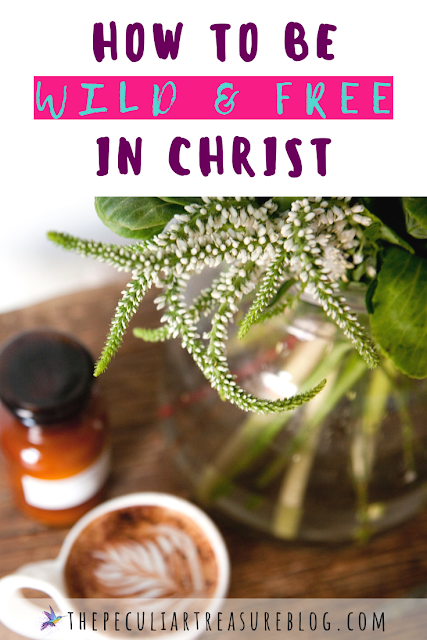 But what does it mean to live a wild and free Christian life? What does it mean to really be free in Christ? Learn how to live free in Christ today. I think I've gotten more awkward as I've gotten older. I talk too much when I get nervous, which leads me to trip over my words, stutter, and say embarrassing things. I think this mostly happens when I am feeling intimidated. There are certain personality types that just make me nervous. People who I deem prettier, funnier, or smarter than me make me feel self-conscious and I end up looking silly out of nervousness. Maybe you can relate. That tongue-tied, say-all-the-dumb-things-moment may be all too familiar to you too. Maybe instead of spewing too many words when you are nervous, you clam up instead. I get it. I really do. 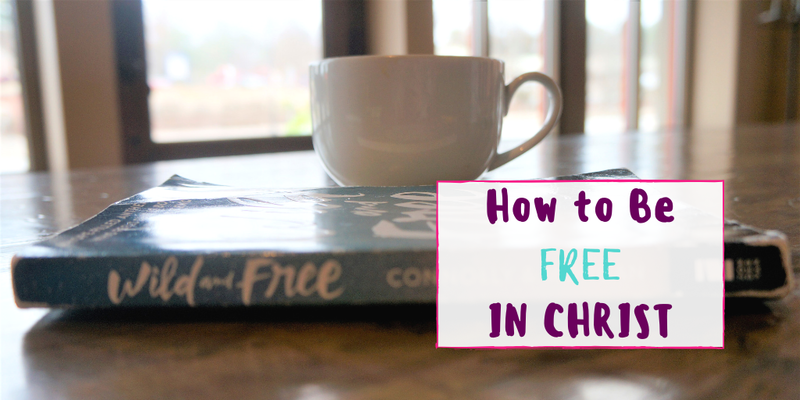 Lately, I've been learning more of what it means to be free in Christ. Free from the more serious things, yes, but also free from things like worrying about what I looked like to other people, worrying about how someone took something I said, and worrying about people's false judgement of me. Instead of worrying what others think of me, worrying that they don't like me, or conversely, judging them for how they appear to me, I should be lifting them up and speaking life and truth into their lives. My freedom in Christ sets me free from worrying about other's thoughts towards me. People may judge me, have a wrong view of me, or just really not like me, but I am free from that. My worth doesn't lie in what other's think of me. My worth lies in Christ alone. I live for Him. I am covered by His blood, mercy, and forgiveness - He has become my life. I am hidden in Christ (Colossians 3:2-4). So to worry about the perceptions people have of me that I cannot control is just silly. As followers of Christ, our job is to trust and follow Him. Our job is to believe the truth and spend time learning the truth more fully in His Word. We are then also called to speak truth and speak life to others. Having the Light in our own lives and then failing to speak it to others would be a waste. I've been learning these things through the book Wild and Free, by Jess Connolly and Hayley Morgan. This is a book I have mentioned previously on TPT, and I will probably continue to mention it, but I figured it was time to do a more formal book review. 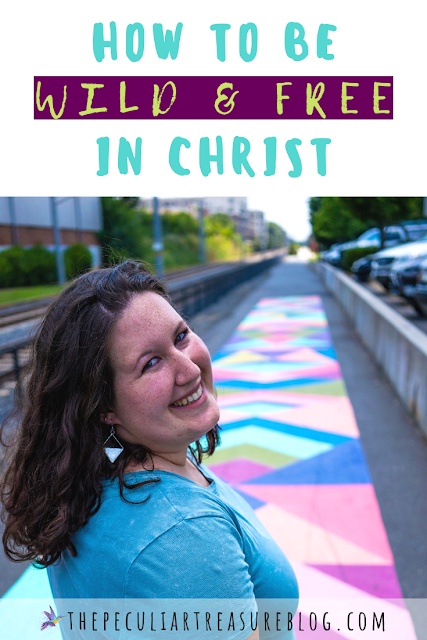 Wild and Free talks about how a lot of the time, we tend to see ourselves as either too much, not enough, or a combination of both. I relate so well to this because I often feel both simultaneously. I often feel that my personality is too loud and big, or that I am talking too much and being annoying. But at the same time, I feel like I am not as good as the people surrounding me, and like I have no real authority because I am somehow less-than the other people around me. I think we all have these moments. We either feel like we are not enough and we try to find ways to prove ourselves and make ourselves bigger, or we feel like we are too much, so we stifle ourselves to avoid criticism. There is something to be said for self-evaluation. I know that in some circumstances I do talk too much, and for the wrong reasons (i.e. for attention, self-glorification, or to appear wiser than I am). In these cases, I do need to reign myself in - not because there's something wrong with a big personality, but because I need to correct my intentions. But that type of situation is not what Hayley and Jess are addressing. What they are talking about is this feeling of being too much or not enough that we either place on ourselves, allow others to place on us, or allow Satan to feed us lies about. Hayley and Jess both give examples from their lives when they allowed these feelings of being too much or not enough to dictate their actions instead of trusting in their identities in Christ. They discuss what it looks like to live a caged-up life or to live defensively, and they talk about why this type of living is harmful. Thinking of God as untamed is a scary thing to me. This is partially because I tend to feel that being "untamed" and "wild" are bad things. When I hear the phrase "untamed", my mind can go anywhere from my untamed hair on a bad hair day, to a rabid dog that must be stopped. But God being untamed is a completely different sort of thing. God is wild in his holiness and in is deserving of all our praise for who He is, and He is wild in His love for us. So while my tainted view of "wild" may make me squirm, realizing that God is the God of the wild in a positive, praiseworthy way is good for me. And I know that God is also a God of order (1 Corinthians 14:33), so I love that He can be (and is) both an orderly God and a wild and free God. Our God - the God who is orderly, yet wild - is a God who is just and holy, yet calls us to the light, so that we can live a wild and free life. He calls us to be holy as He is holy, to bring things into the light (that is, to Him), and to trust that in that light He gives grace. Related Post: Do You Believe in the Real Jesus? Jess and Hayley go on to say that when humans were created, they were created wild and free. That's the identity that Adam and Eve had. They were in wild and free communion with a wild and free God. When sin entered the world, that wild and free communion was broken, and so was our identity as wild and free. It was tainted and marred. But God calls us back into the wild. 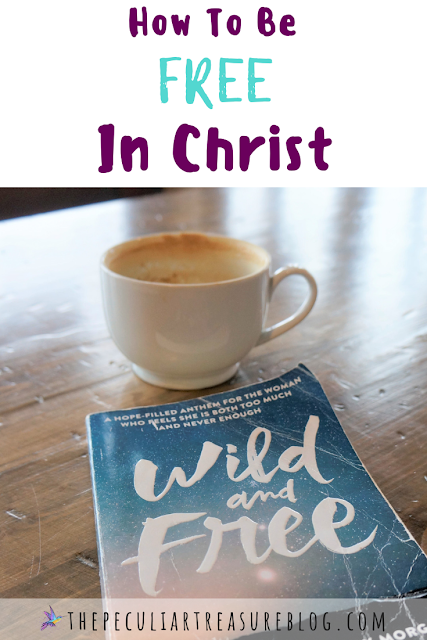 He invites us to live in our wild and free identities in Jesus. The rest of the book describes what wild and free should look like. It shows us how to view others, how to interact with them, and how to embrace our identity as wild and free followers of Christ. It encourages us to stop living lives that are defensive, afraid, and tame. 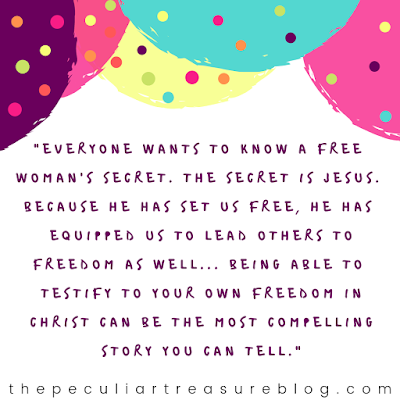 It encourages us to be the people God created us to be, to use the gifts we were given for the glory of God, and to display this freedom to our tamed and subdued sisters in Christ. There is danger in staying tame, and yet sometimes we prefer captivity. Freedom is better, but it's something we have to stand in daily (pg. 188), and we cannot allow ourselves to go back to legalistic, fearful, or defensive living. This is great news, and it's news we should be sharing with others. Hayley and Jess spend the rest of the book explaining how we should be a light for Christ's freedom that is so bright that our sisters in Christ want what we have. But that means living out freedom to the fullest, and that means telling people about this freedom. Honestly, freedom is a daunting task in my mind. 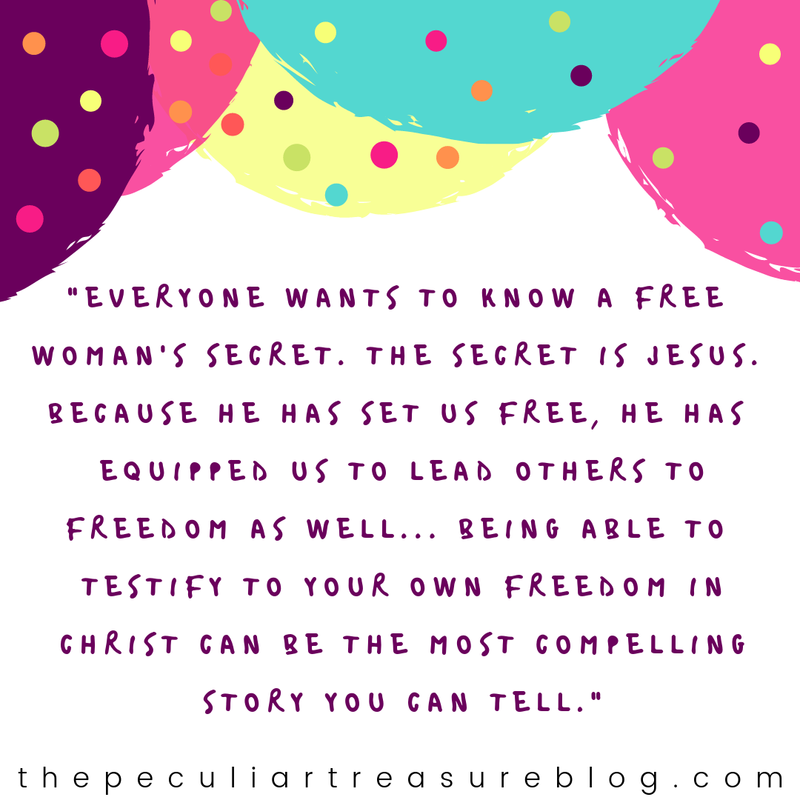 As someone who frequently struggles with legalism, and is constantly battling the lie that I taint or undo my standing before God when I sin, I still struggle to walk in freedom. But I am so thankful for this book because it has exposed some of the lies that I have been believing about God, grace, and legalism. It has offered a breath of fresh air and has planted truths in my heart about God's love and grace towards me, and my standing with Him. It was for freedom that Christ set me free (Galatians 5:1), and it is this wild freedom that I seek to walk in more fully from now on. And I want to share that with others. This book is worth the read, peculiar people. It has the potential to change the way you see yourself in relation to God, while being rooted in the truth that God's glory is what matters. It isn't a self-help, feel-good book, yet you will probably come away feeling joyful at the fact that Jesus has already made us wild and free in Himself. He has already given us a beautiful identity that we must accept as truth. He has already given us the ability to get out of the cages of sin, fear, and small living that we often lock ourselves in. He has called us to great things for His glory. He loves us. 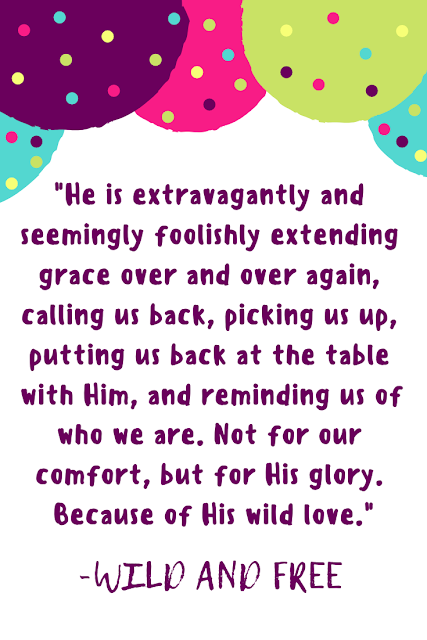 He has given us a royal standing before God. And that is great news that I can always benefit from being reminded of!